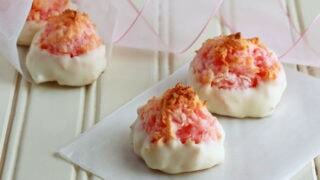 Next up on the month-long countdown to Valentine’s Day: festive pink macaroons. These little coconut cookies look a bit unassuming. If you think coconut macaroons are just globs of shredded coconut held together with some stuff and taste plain like coconut, I have to say you’re wrong. As the coconut bakes in the oven, the edges get crispy and buttery. My macaroon recipe calls for almond extract, which makes these little chewy cookies with crispy edges taste like candy. A coconut truffle of sorts. 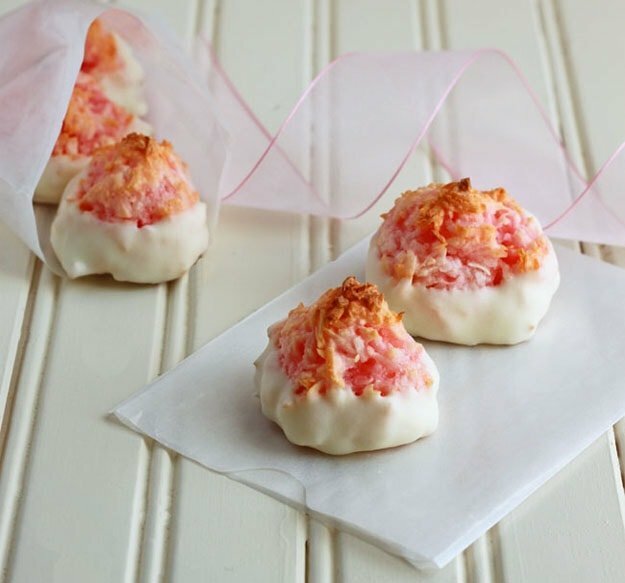 Once dipped in white chocolate, they are not only delicious, they are festive for Valentine’s Day. I added one drop (seriously, just ONE) of red food coloring and they became a pretty pink. I shaped my cookies into little pyramids, but I’ve also made them round before. It’s up to you. Next time, I think I’ll make them flat to maximize the crispy brown cookie bottom edges. My coconutty Valetines, this one is for you. In a medium bowl, stir together all ingredients (except white chocolate). Use a large spoon to scoop 6 cookies onto a baking sheet lined with parchment paper. Do not compact the cookies or the toasty edges will not form. Scoop them loosely. Transfer the baking sheet to the oven and turn it down to 325Â°. Bake for 25 minutes. Let cool completely. If you would like to dip the cookies in chocolate, melt the chocolate in the microwave on short pulses. Pour the melted chocolate into a small bowl and dip half of each cookie in the chocolate. Let chocolate dry before serving. I owe you a wedding update. What pretty little love bites! 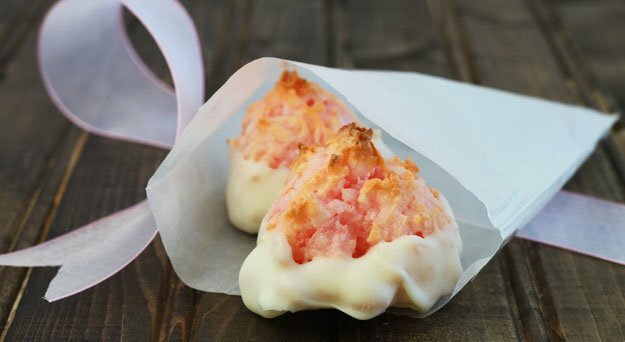 I’m such a fan of macaroons, and you described their crunchy, wonderful edges to a T. Another winning Valentine’s recipe Christina! I love everything about these guys! Suer cute and festive! So pretty and very tasty too, I’m sure. I kind of hate Valentine’s day, but I like cute pink treats! I love how you fancied up these macaroons. Very pretty! Do you put the egg white is as liquid, not beaten? And did you put the food coloring in before baking? Looks yummy! These are so lovely, and I bet SO delicious! Thanks for sharing, Cristina! I know someone who will love these just because they’re pink. Love coconut macaroons. Best cookies ever! These are like the cutest things ever! Love! I would have thought these were a lot more complicated to make. When I was doing a juice cleanse at the end of the day I got to have a cashew milk and a macaroon. Granted it wasn’t as awesome and luscious as these, but still I fell in love with that coconut flavor. These might just be a V-Day gift for myself. Aww, these are so pretty. I thought you had actually put some strawberries into the macaroons. I’m not even sure is strawberry and coconut go together, do they? Well either way I would probably keep these all to myself if I made them. These are adorable! I’d love the pop of pink all year long! This look perfect, so cute and colorful! I don’t think I’ve had macaroons since I was a kid, but I used to love them (even though I wouldn’t eat anything else with coconut in it) – I’m so glad you shared a version! There used to be a place in Kansas City that made a mean macaroon….I wonder if it’s still there. What if I have only unsweetened coconut? Should I add more sugar? Hi Ki, I don’t know if you should try it without sweetened coconut. Sugar is a liquid ingredient in a recipe, and without it, I’m afraid your cookies will fall apart. Sorry! These are lovely – so very pretty! These are sooo adorable! Great Valentine’s idea! Just came across your website and I love love love it. Our youngest of four boys just left for college and I need to scale down my cooking……Thank you so much for sharing! I love that your recipe uses almond extract, I’m going to have to try that! These are beautiful!! I love this Valentine’s Day countdown… I just posted my first recipe, but not sure how many more I’ll do before the big day! I hadn’t even begun to think about V-day yet, and whether or not I would even “celebrate it,” but your posts are definitely a big push in that direction! I may not have an actual valentine, but that’s no reason why I can’t enjoy a few sweet treats. ;) The light pink color of the macaroons is simply charming. Hey Christina! These are simply beautiful! I’m new to this site and love it! Can’t wait to read more.